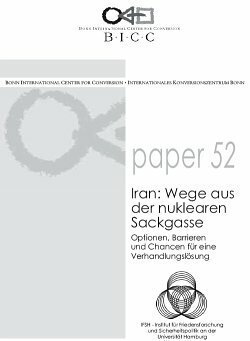 The Bonn International Center for Conversion (BICC) and the Institute for Peace Research and Security Policy at the University of Hamburg (IFSH) organized a panel discussion on 14 June 2006 on which international experts voiced their opinions on the conflict about the Iranian nuclear program. The international community is faced with the questions: How to continue? Is it wise to get involved in negotiations or at least in ‚talks on negotiations’ and to drop the preconditions? Or should it, as demanded by the United States for a long time now, impose sanctions against Iran? If so, what sanctions to agree on? The United States have not yet dropped the military option even though it seems to be unlikely at present. The event in Berlin focused on these questions. BICC paper 52 documents the statements of the participating experts.